Buster Keaton proves to be the biggest obstacle in the way of When You Fall Down, James Dangerfield's one-man musical biography of the silent movie star. The real Keaton is a silent movie star famous for his deadpan expression in the face of chaos and absurdity. 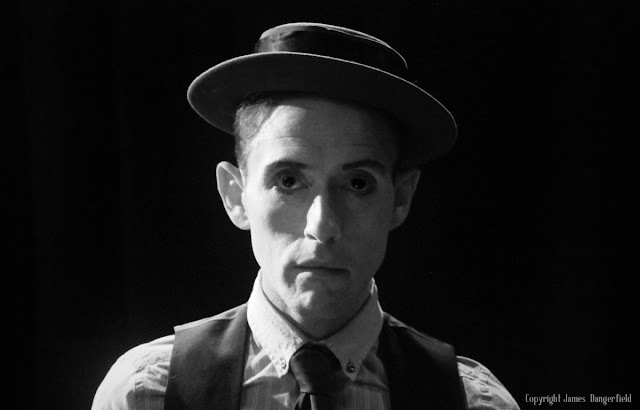 Dangerfield's Buster Keaton emotes wildly while singing heartfelt songs. Can the show square this circle? Keaton's films are always worth a bit more attention. A couple of years back I went on a big silent movie binge, finding that Keaton's films having aged magnificently due to their combination of terrifying, imaginative and dangerous stunts, imaginative use of technology and the innate charisma of Keaton himself. But I don't need to spend time convincing anyone of how awesome Buster Keaton was, just skip to a random place on this video and I guarantee you'll see something that will make you laugh, wince, gasp or some strange combination of the three. The show's narrative covers Keaton's career up until 1928 when began working under contract for MGM, a move generally considered to have marked the end of his creative golden age. Along the way we see him becoming entranced with the possibilities of cinema, bemoan the unjust treatment of his friend and mentor Roscoe "Fatty" Arbuckle and taking pride in starring, writing and directing his own movies (referring to himself as "the navigator"). This runs parallel to peeks into his personal life: his alcoholism, the failing relationship with his wife, his passion for his work affecting his relationship with this children and so on. Sadly, it doesn't. James Dangerfield is a talented man, echoing Keaton's creative control by performing, writing and composing everything in the show. But his performance just never really felt like Buster Keaton. There's simply too much broad emotion for a man known as "The Great Stone Face", combined with a set of generic musical theatre tics that could have come from any show. I suppose there's an argument that Dangerfield is playing the 'off-screen' Keaton, but then you're playing a character you've invented rather than trying to capture Keaton's personality. These flaws are exacerbated by a collection of samey songs that never break out of traditional musical theatre rhythms and rhyming schemes. I can accept the odd plodding ballad or expository set of verses, but the show is painfully in need of more interesting music - the unchanging meter quickly becoming hypnotic rather than engaging. All the above is not to say this is an unenjoyable 50 minutes. Though Dangerfield doesn't evoke Keaton, he does present a compelling, expressive and ultimately likeable figure. The show is peppered with moments lifted from old-school vaudeville acts: a letter appears from thin air, Dangerfield tumbles onto the floor and water transforms into multicoloured liquids before our very eyes. You can sense that the show is borne of genuine admiration of Buster Keaton, and, in common with his movies, you can sense the blood, sweat and tears that have been poured into making this happen. 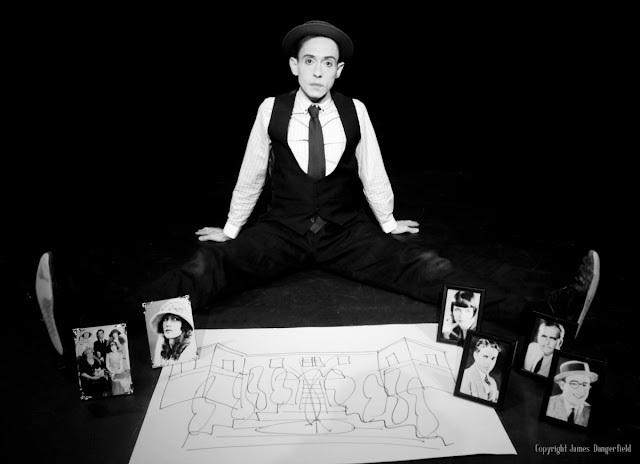 But, at the end of the day, a musical theatre show full of broad emotions and didactic songs simply doesn't suit the story of Buster Keaton. It's telling that by far the most exciting bits of the show are when footage from his films is projected behind Dangerfield - with even these short moments provoking actual gasps from those in the audience. When You Fall Down is a swing and a miss, but at least its heart is in the right place. When You Fall Down will be at the Edinburgh Fringe August 1-27th: The Pleasance Courtyard, Tickets here.